priate cholinergic or peptidergic nerves leading to the pancreas can stimulate exocrine pancreatic secretions (see Figure 8-15). Pancreatic secretions of electrolytes and H20 from the ductular and centroacinar cells are primarily under the influence of secretin. Secretin is known to stimulate intracellular cAMP in these cells, which activates unknown factors necessary to alter the secretory cell membrane permeability to sodium and hydrogen ions. Thus, there is an increased exchange of external Na+ ions for internal H+ ions. 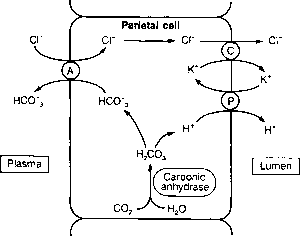 The increased concentration of extracellular H+ lowers the local pH, which then increases the production of C02 from circulating bicarbonate. This C02 then diffuses into the cells, where it combines with water to form carbonic acid (mediated by carbonic anhydrase) and results in the production of HC03", which can be utilized for secretion. The pancreatic secretion of digestive enzymes occurs in the acinar cells of the exocrine pancreas under the influence of CCK. In the pancreatic acinar cells, CCK interacts with a receptor present on the outer cell membrane. 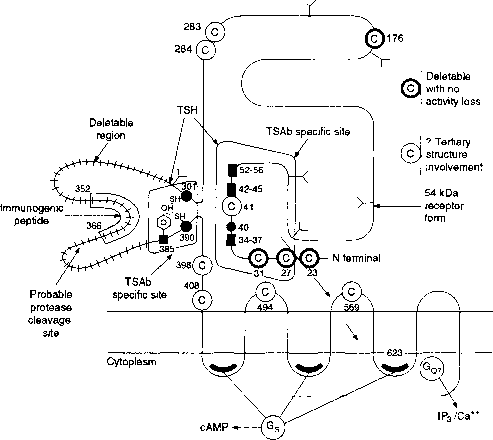 This activates a G protein-coupled signal transduction pathway (see Figure 8-15) to ultimately stimulate the secretion of amylase, trypsinogen, and chymotrypsinogen stored in secretory granules. TABLE 8-10 Composition of Human Pancreatic Juice"